Every Road Leads Home . . .
Just five minutes from the Four Chimneys Inn, Southern Vermont College is host to numerous outdoor walking trails in Bennington. Originally contracted as logging roads to help the Everett family gather fuel for their wood-burning furnaces, each trail measures about ten feet in width. If you look close enough, you can actually see the grooves left by the logging trucks that made their way up and down Mt. Anthony. Because there are so many hiking trails here, we’ve decided to narrow it down just for you. To access all of the Southern Vermont College hiking trails,turn left ouf of the Four Chimneys Inn. Proceed approximately 1000 yards and turn right on Monument Avenue. Proceed approximately 1/4 mile and turn right on Redwood Road. Take an Immediate left onto Mansion Drive. Proceed up the hill approximately 1 mile to the main parking lot and Everett Mansion. There is a trail head marker board in the parking lot. Apple Trail (1 mile) and Happy Trail (2.3 miles): With names as cute as these, who wouldn’t want to get in a nice workout on these SVC trails? Regarded primarily as fitness trails, the Apple Trail and the Happy Trail circle the perimeter of the campus, giving you all the endorphins to keep you energized for more adventures on your Vermont vacation! Carriage Road (0.4 miles): If you are looking for a beginner-friendly walking trail with amazing views and cobblestone ascetics, the Carriage Road is perfect for you! 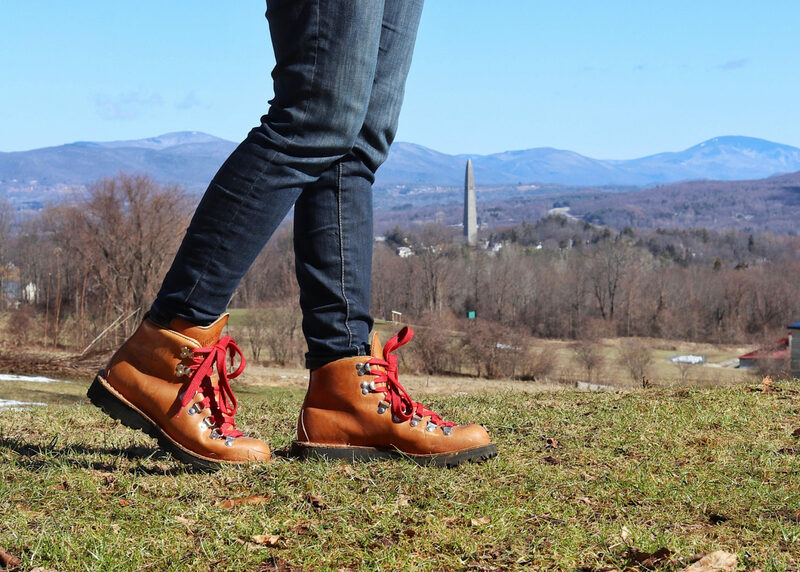 This trail takes you to along the old access road to the Everett Mansion with an overlook of the Battle Monument, Vermont Valley, and The Green Mountains. Cave Trail (0.6 miles): An intermediate walking path, the Cave Trail starts at Carriage Road and includes an uphill climb to Everett Cave, a solution cave carved into the side of the mountain. After that, it’s all downhill to the Garlic Festival Fields at Camelot Village. Everett Path (0.3 miles): The Everett Path is an intermediate path which starts at the Southern Vermont College’s Maintenance shed and ascends to the Everett Mansion’s Cascade, an exquisite multi-tiered fountain running the length of a stone entrance into the forest, an enchanted wonderland full of mystical qualities and unequivocal beauty. Fieldhouse Trail (0.23 miles): a mowed path that connects the SVC fieldhouse to Carriage Road. Halloween Trail (2 miles): Named after a mysterious old growth burled maple tree along the northern section of the pathway, Halloween trail runs from Carriage Road north of the Everett Mansion all the way to the Garlic Festival field at the intersection between Route 9 and Fox Hill Road. The trail is relatively easy to walk apart from a steep section mid-way through if you choose to start at the Garlic Festival field. 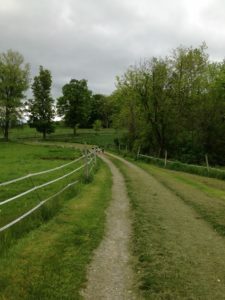 Old Farm Road (0.5 miles): This beginner trail can be used as a shortcut to the Everett Mansion area from Monument Avenue in Old Bennington, Vermont. Orchard (0.5 miles): This path wraps around the field edge from Old Farm Road connecting to the northern side of the SVC Fieldhouse. Ursa Way (0.6 miles): Best traveled South to North, the Ursa Way is an intermediate to advanced hiking trail which starts at a gravel road and climbs upwards toward the college’s water tank. A hard left, an upward hike on an old logging road and a right turn takes you all the way to the upper SVC field where you’ll catch some incredible views of the Green Mountains. Just a 15 minute drive from our Vermont Bed and Breakfast. The innkeeper is happy to show you a map to get to the trails below. Mile-Around-Woods (1.4 miles): A scenic road laid out by Trevor Park at the close of the Civil War, the Mile-Around-Woods is a short walk from the grandiose Park-McCullough House located in North Bennington. In 1994, the land was donated to the Fund for North Bennington in 1994. Before then, the property had been in the McCullough family name for over two hundred years. The trail was built to function as a circular carriage route and features extraordinary views of wildflowers and undergrowth under a canopy of green. The Mile-Around-Woods welcomes all skill levels. Robert Frost Trail (2 miles): This lovely footpath runs from Lake Paran in North Bennington all the way to the Robert Frost Stone House Museum in Shaftsbury. Marked with blue painted blazes, the trail threads through deep woods, several breathtaking waterways, as well as an orchard and red pine strand planted by Robert Frost in the 1920s. With gentle slopes and flat pathways, the Robert Frost Trail is perfect for all skill levels, whether you’re looking to get in an early morning run or simply to enjoy an afternoon stroll. Step back in time as you pass by The Frost Farmhouse, the site where he penned such memorable poems as “Stopping by Woods on a Snowy Evening” Apart from its historical intrigue, the trail also offers astounding views of the surrounding area, particularly south to Mount Greylock in the Berkshires, west to the hills of Hoosick, N.Y., and east to the Green Mountains. Don’t feel the need to rush through just to grab a bite to eat elsewhere, the footbridge provides benches with amazing views of Paran Creek – the perfect place to stop and eat a box lunch from Elm Street Market. White Rocks Trail: This challenging trail is filled with twists, turns and rocky vistas. While not for the novice, this mountainous trek will satisfy the body and soul. A word to the wise: take great care during wet weather as this trail can be slippery. Directions to the trail head available from the innkeeper. Wind down after your day of hiking in Vermont with a leisurely stroll around the historic neighborhood of Old Bennington and the beautiful grounds of The Four Chimneys Inn. Relax with a cold beverage on the Four Chimneys Inn stone patio, take a relaxing luxury bath and get an amazing night sleep on our Comfy brand linens. Book your vacation at our Vermont B&B now.